Our collaboration with the Main Branch of The Salt Lake City Public Library System began with a few items needing repairs or updates. The Information Kiosk had metal plates that had lettering cut into them that over time had been pulled up from the sides of the Kiosk. Slats on the floor directories needed to be reprinted due to updated listings and damages. 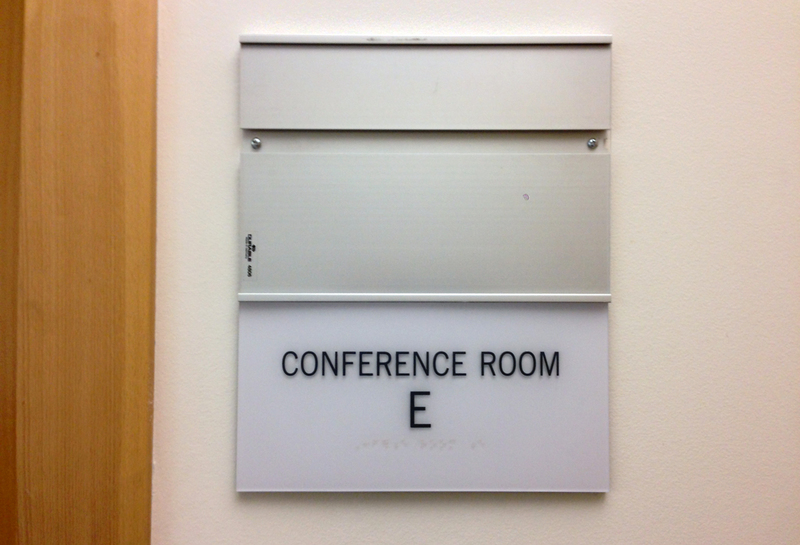 One sign for a conference room had been damaged and needed replacing. After several discussions about possible solutions and costs for the kiosk it was decided to pull off the existing damaged plates and replace them with solid metal plates as this is an area where a large number of people come through and updating the panels to a solid material would hold up to the wear and tear for a much longer period making replacement to be needed less often. For the conference room sign after discussing different materials and how the library had placed holders to slide in inserts of what the conference room was being used for that were far bigger than the existing damaged sign. 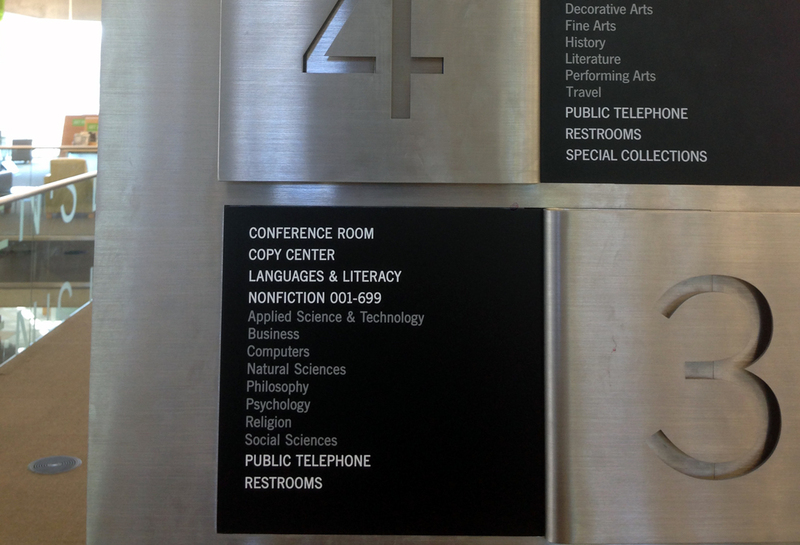 It was decided to change from the more expensive bent metal signage and replace it with a white acrylic sign with dark gray tactile type and braille underneath to meet current ADA requirements (American with Disabilities Act) that was the same width as the new holders that contained the information on what event the conference room was currently being used for. 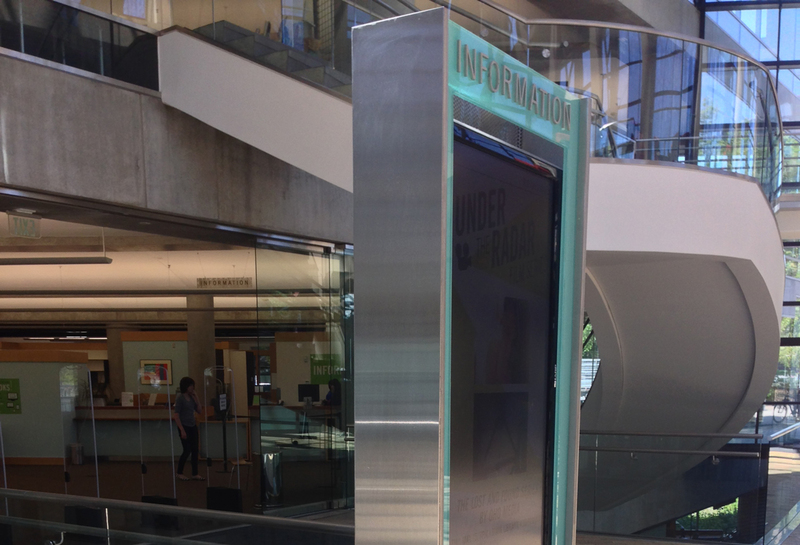 In 2014 we entered into collaboration on the design and manufacturing of an exterior tenant identification for the Shops at Library Square and insert units that could be placed into the Holds and Audio Visual sections of the library to inform visitors where breaks in these stacks occur. The process of the collaboration was to first determine where to place the exterior tenant identification for the Shops at Library Square. These discussions centered on what the costs and benefits would be to placing the exterior tenant identification on the ground or mounting it to one of the light poles. After discussing possible solutions it was decided for both budgetary as well as functional reasons that placing it on the light poles would offer the most benefits as it would be less expensive to manufacture and since 4th South and 2nd East is a busy intersection it being up in the air would provide the most lines of sight to be able to see the exterior tenant identification signage. The collaboration then moved to the aesthetics and functionality of the signage. It was decided to use darker and lighter grays to add legibility between the tenant names. Each name was placed on a removable slat so that the exterior tenant identification can be updated easily. 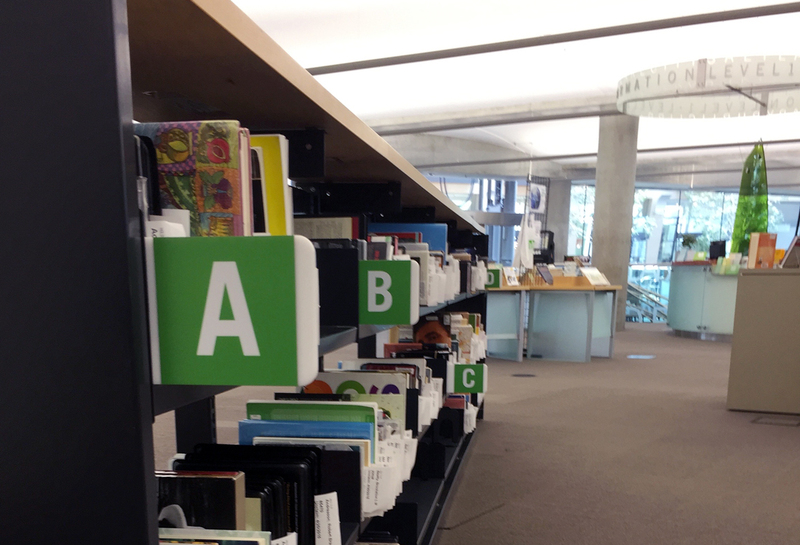 Dimensional painted letters were used for the Library Square Identification to magnify their presence. 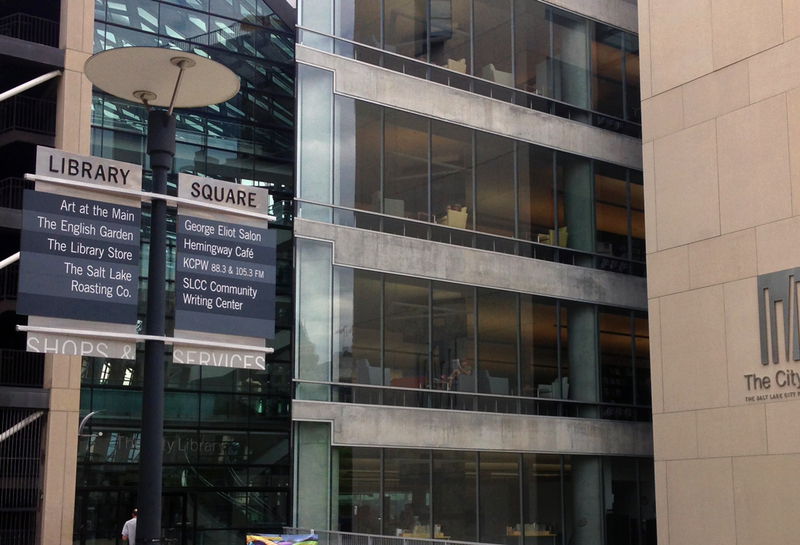 White lettering “SHOPS & SERVICES” were placed along the bottom of the sign and cut off to mirror the lettering that exists on glass panes above the Shops at Library Square’s interior entrances to the tenants spaces. In 2017 we collaborated on updating the listings to the exterior tenant identification as tenants moved out and new tenants had moved in. 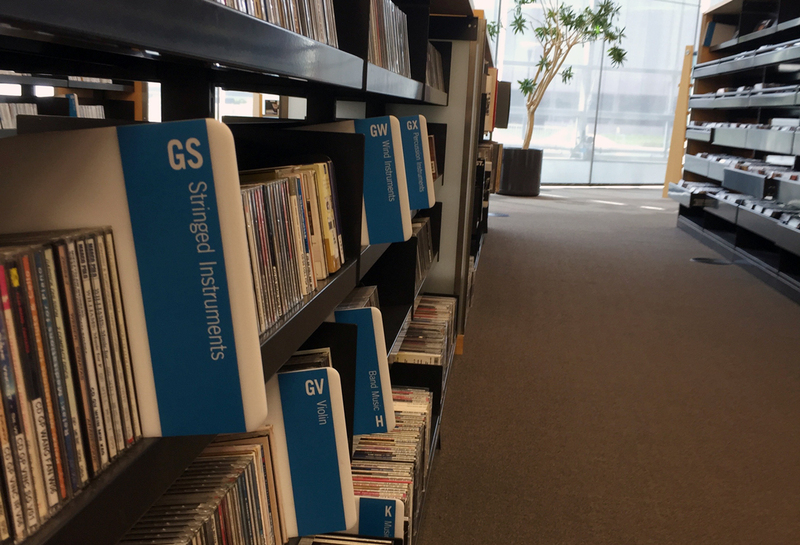 The collaborative process on the inserts to be placed into the Holds and Audio Visual sections of the library was largely focused on possible materials to be used, developing a solution that could be used at other branches of the library system, and easily maintained by the Salt Lake Public Library System. The solution that was settled on was to use white acrylic which is a durable, affordable and readily available material and place printed vinyl material on it. 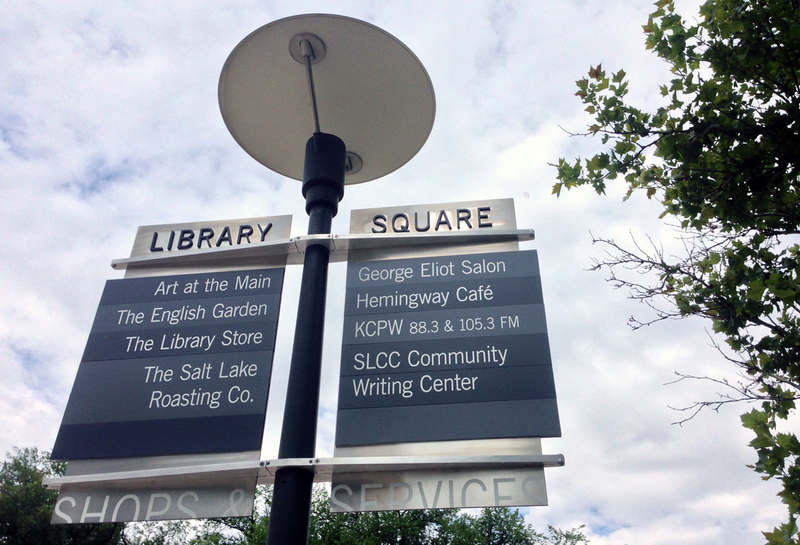 A printed vinyl with the Salt Lake City Public Library’s design standards Blue and Green as background colors was decided upon as the Library system had begun incorporating printed vinyl pieces into the informational and wayfinding in several of the branches and thus down the road they would be able to update inserts as needed as well as match what they were developing.